Before we dive in, let it be super clear that I did NOT hit my goals for the month, however, the inches off of my waist are still dropping and I feel my healthiest and lightest, though the scale isn’t reflecting that. My final weigh-in for September was 0.2 pounds lost, bringing the year total lost to 19.5 pounds. I took the initiative to completely overhaul my schedule after becoming frustrated with my (lack of) results in August. Instead of going to the gym immediately after work and feeling cramped for time in the evening, I wanted to start my day on the right foot and go in the mornings before work. Recently, I discovered that it felt as if I had zero time to do the things I needed/wanted to do once I came home and unwound from the gym and I thought the schedule change would ignite some newfound motivation. 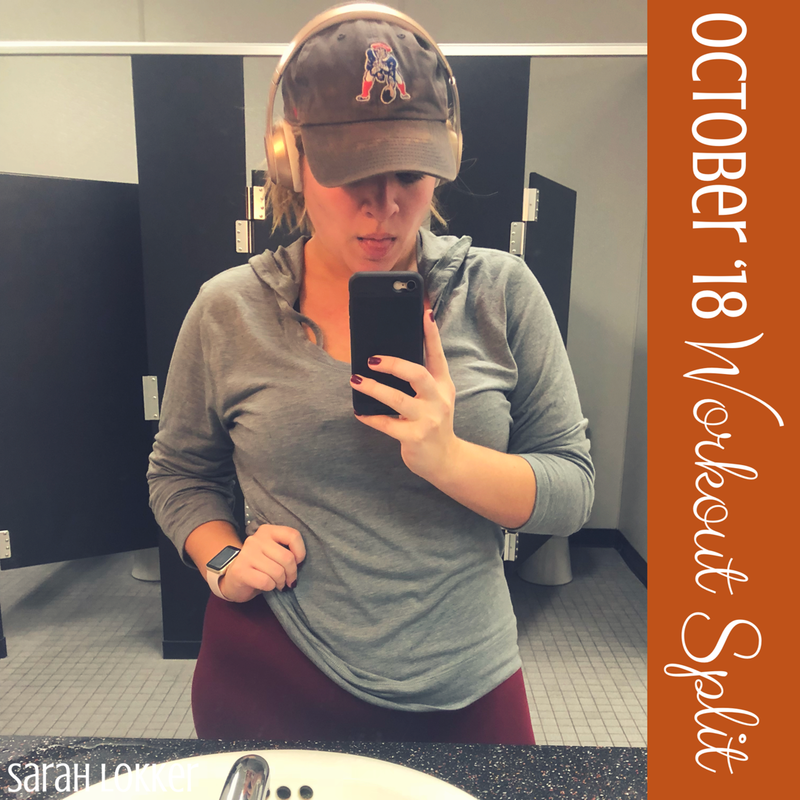 I managed to get up before the birds and hit the gym every weekday in September and truthfully, I noticed that I had so much more time to get things done in the evening! The first week was rather easy to adjust to, because my social calendar had events on it that would have forced me go for an A.M. session anyway. As the month progressed, it wasn’t even a hesitation to continue the morning grind because it had sort-of became a habit to wake up earlier. I’ve always been a morning person, though not really by choice, so the early wake-up call was just like second nature. With the alarm set earlier, I didn’t enforce an even earlier bedtime. I figured that if I could maintain at least 6-7 hours a night, I’d be able to manage. Note: I’m someone who used to aim for 7.5-8 hours nightly, so I didn’t expect it to be that much of an adjustment and I didn’t sense a difference early on, until my exhaustion became a perpetual part of my personality and zombie brain took over 75% of the time. When it came to workouts, I had adopted a mentality that I felt became very beneficial in the long run: While on the arc trainer, I would try to ‘beat the clock’, where I would see that I had 3 minute left until a milestone time (ex: 10 minutes), and I would try to burn X-number of calories before then. These bursts of intensity really helped elevate my performance and I loved the thrill of competing with myself. I also discovered a form of working out on accident: fasted cardio. Since I was going to the gym early and on an empty stomach, those mornings I was completing a cardio exercise (arc trainer/stationary bike/etc.) were more beneficial because it was burning more body fat, which was becoming apparent when I stepped on the scale. On those mornings I got a late start, I’d opt for the 45 minutes of fasted cardio because I knew it would burn a) more calories and b) burn more body fat. Another big milestone was the fact I was PR-ing on the treadmill. I discovered quickly on that the goal I established was going to be nearly impossible because I didn’t account for training for it properly. Even though I didn’t hit my goal of 1:30-minute runs/45-second walks for 30 minutes, I was able to get up to a 1:30-run. Running has become much easier on my body and I’m still learning the best form/techniques so it can become another option for cardio days. September helped me regain some of my motivation I had lost over the last few months, and now I’m ready for a transPHORMation. That’s right, I signed up for 1st Phorm and for the month of October, I will be completing the 30-Day Challenge. I have seen a lot of people in my life become super successful on this program and I’m always down to try new things, and this workout split will be nothing like I’ve ever done before because this will be a strength-training focused regime. We know that I love a Split that is fully inclusive so I will also be following the diet plan that accompanies the Workout Program. They say that a successful weight loss program is 80% kitchen, 20% gym, and I have had major success with meal prep in the past. This meal plan is nothing like I’ve ever done before because they actually encourage you to eat a ton (of veggies!) and who doesn’t love to eat?! Since 1st Phorm is completely free to sign up for, I won’t be posting the weekly schedule on this site. For those playing along at home, I will be completing the Intermediate Workout Program. This entry was posted in fitness and tagged #blogger, bbloggers, be healthy, beast mode, beauty blog, blog chat, blogger girl, blogger life, blogger lovin, blogger style, bloggers, blogging, blogging gals, blogging tips, diet, fashion blog, fbloggers, fit chick, fit chicks, fit fam, fit foodie, fit girls, fit life, fitness journey, gainz, get strong, girls that lift, gym addict, gym life, gym rat, gym time, health, health and fitness, healthy, healthy lifestyle, healthy living, inspiration, life with sarah, lifestyle, lifestyle blog, live fully, making it happen, motivated, muscle growth, never give up, on the blog, progress, sarah lokker, sarahhlokk, savvy blogging, squat, strength, the dedicated, train hard, train harder than me, weight loss, weight loss journey, you can do it. Bookmark the permalink.